What is there to say about Jane Austen that hasn't already been said? I think Persuasion is probably my favorite of her stories. Could it have anything to do with that fun little "Who is your Austen Hero?" quiz returning results telling me that I had married Captain Wentworth in civies? 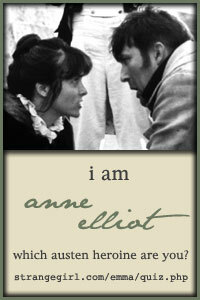 Husband (or Sean, as some of you now know him thanks to his birthday hacking) is a lot like Anne's long remembered love. Hard working, dutiful, loyal, and dare I say, a little proud but not Darcy-ish. Anyway... if I could persuade anyone who didn't think much of it to give themselves a chance to enjoy this story, I would certainly try! And, risking losing credibility with every Janeite here, I would even go so far as to say that if you don't have the opportunity to sit down and read it, please consider the movie as a substitute. I think it was exceptionally well done and captured the meat and flavor of the whole story only allowing for minor changes here and there which aren't of huge consequence. Amanda Root and Ciaran Hinds are wonderful together and are complimented by the talents of Judy Cornwell, Sophie Thompson and Fiona Shaw making it delightfully entertaining. I don't know anything about this version but it is a more recent version with Sally Hawkins and Rupert Penry Jones. I am afraid I won't be able to watch that one because I had a similar experience with Sally Hakwins, so I understand. But definitely pick up the book! I need to get about reading Northanger Abbey. My SIL keeps telling me I will enjoy it! I love everything Austen; but I agree Persuasion is my favorite. It was the one I chose to teach the one time I taught a lit course and got to pick the books. What a fun little summer class that was! Never knew that she was finishing it prior to her death. That kind of puts a different lime light on it. Oh, I could have written this post---except you write much better than I do. My husband is Capt. Wentworth, too. I like the book, but I love, love, love that movie with Ciaran Hinds and Amanda Root. Funny thing is that my husband has never been able to stay awake for it, though I've given him many opportunities. Lol. That love letter at the end? Swoon. I know I spent quite a bit of time t the beginning putting it in context. Asking the students to think about what marriage is for and what makes a good marriage partner. For most of them Austen is such a foreign world. About as strange as Homer really. And we spent a lot of time going over plot and characters. I think the basic theme I tried to outline is the idea that is universal in Austen: the importance of choosing the right spouse for the right reasons and how that affects the future children. Austen spends so much time showing the damage that occurs when people marry for looks or money and then find themselves trapped with a shallow person who doesn't really suit them. Oops gotta go. I'll try to remember more precisely what was more specific to Persuasion. 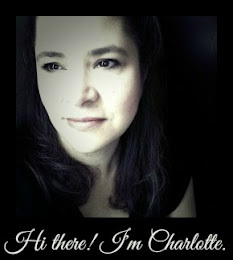 Oh, Charlotte, I couldn't agree with you more! I love all Austen's works, but Persuasion is by far my favorite. I own the movie (Amanda Root version) and watch it at least once every six months. :) It is beautifully done. I LOVE this movie version. I haven't read the book though. It's on my list of to be read. I don't think I have enough time for all the books. Persuasion is my favorite too. And I like both movie versions, although there are things I would change about both of them. Or rather I would combine them to make the perfect Persuasion movie. Amanda Root version: The circus at the end always bugs me. Love Ciaran Hinds! Persuasion is also one of our favorites! I have to admit that I haven't read it yet but am clicking over to the library to borrow it from here :) We saw the one with Sally Hawkins and Rupert Penry Jones first - so it's our favorite. I think that has alot to do with it - don't you??? We don't have this one in our collection - yet :) My husband will ask from time to time if we are ready to borrow it from the library. I feel very blessed that he shares our love of Austen! That circus scene is the one scene in the movie that I don't really understand either. There is a place in Bath called The Circus. But why there would need to be a real circus coming down the street, I don't know unless the director was commenting on how the two lovers have found each other again even amidst the circus of life around them. I think that has a ton to do with choosing favorites. How wonderful that your husband enjoys Jane Austen with you. Mine enjoys it from a history buff's perspective but he mostly tolerates it for me!